The most frustrating thing for my daughter when it comes to ride-on toys is being stuck going only one of two directions. She would back herself into a corner with no where to go! The new Little Tikes Pillow Racer has 360 movement, allowing her to scoot sideways, easily turn and spin. It also makes it easier when she’s pushing it around – less likely to get stuck. The Pillow Racer is unique with the directional freedom it offers. It is also the only rider we have that didn’t require any tools for assembly! I easily put it together while my daughter begged to go outside, and was done before the hissy fit could start! The hardest part was stretching the fabric over the no-tip stabilizing bar – there just wasn’t a lot of give. The other unique feature is the soft cushy creature that makes the seat can be removed for use as a cuddly pillow. I personally do not want to reassemble it constantly, so she is unaware it can do this for now. I was nervous that she would fall off the back due to the curve of the ladybug’, but she holds on! She does have trouble hopping on this one by herself (she’s only 17 months old) because the ladybug is wider than her horsey. She likes pushing it around though! 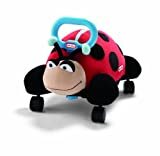 We received the Lady Bug Pillow Racer in order to facilitate a review. I have now purchased 3 of these pillow racers. Each child that has received one has absolutely loved theirs! Two of them went to my grandbabies that have had so much fun racing and chasing each other. Also they had a small amount of assembly that had to be done, but it was easy and fast to do. I will buy more! I bought this for my granddaughter (27 months) with the idea that it could be passed on to her little brother when she outgrows it. The Ladybug is very cute, easy to assemble, and rolls on the floor better than other riding toys I’ve seen. I’m not sure how many times the base will be removed so the toy can be used as a pillow, but it is nice to have that option.